I am really good at procrastinating. I’m not so good at hurrying up a patchwork quilt. But who’s in a hurry, anyway?! Let’s not dwell on how much time it’s taken me to get to 25 blocks. Let’s not even spare a seconds-thought to how much longer before my amazing quilt will be ready to throw over my bed. Let’s just focus on the here and now! This is a Churn Dash quilt block. Also known as a Churn Dasher or Roads to Berlin. The 25th block I’ve created to date and boy can you see how out of practice I am! If I’d have retained momentum. I’m sure the inset seams would have been neater. Only one point matches up precisely. And I’m so pleased with that. But not pleased enough to unpick and sort out the other three! It’s only that Mr O is away that I’m doing this otherwise I should truly be working on his waistcoat. So I should not spend a minute more on this. In any case. If I want that ‘handmade’ look about my quilt, it needs to have a couple of imperfections at least! The next one will be spot on, I’m sure. History: Another 1930s favourite. One of many blocks inspired by 19th century domestic appliances! Works on its own or used as part of a more complex design. Level: Set in seams require experience. I’m all for having a ‘handmade’ look to quilts which is just as well as nobody would ever think mine were anything but. Not quite matching points and less than perfect quilting stitches are what make quilts so personal and charming. By the time you get to join all your blocks together and make the quilt sandwich and add your quilt label you will be so pleased with it you won’t notice any little imperfections – and neither will anybody else. Honest! Hello! 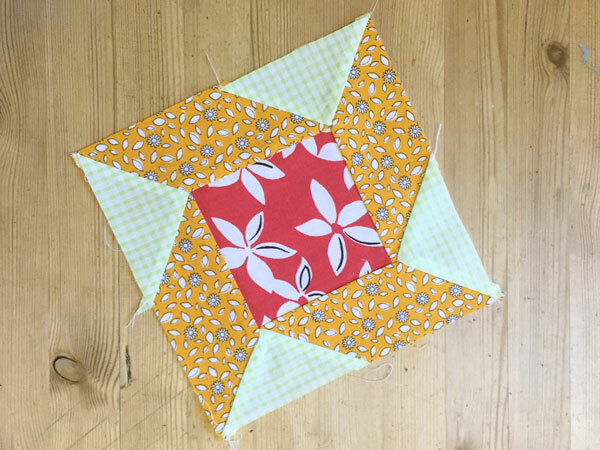 Now that is a pretty block, and quite different from the block we call a churn dash around here, which is pretty typical of quilt block names 🙂 I think your one would look amazing as a repeated block, that sense of motion would have a lot of design energy. I’d be interested to see what your Churn Dash looks like! It’s pretty crazy as a repeat. Who knows I might even try that in another 3 years time!! Absolutely stunning, dear Lady. I deeply admire people who sew patchwork … I am totally unfit for the job !! Whoever thinks of the time spent when you finally finish and enjoy it?